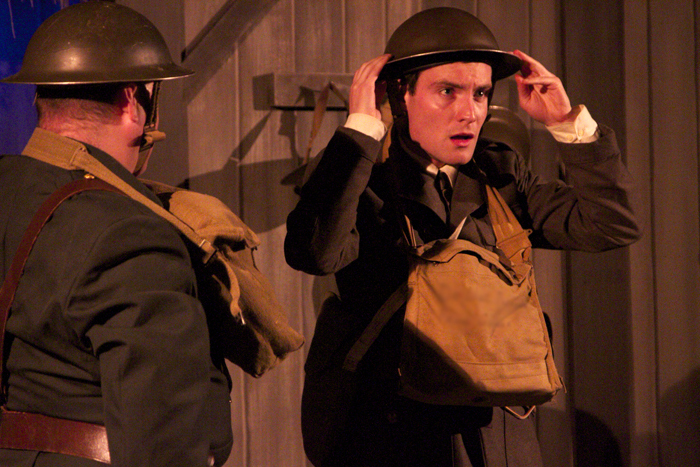 The Empty Room’s current production of RC Sherriff’s World War I drama Journey’s End is so much better than it seems on first reflection. When broken down for parts, 98% of it is in fine, working order. Some of that 98% I would even call excellent (Joshua Stodart’s steel-nerved scamp of a Mason, for example, not to mention his short turn as a terrified German captive). The trouble with Journey’s End is that that final 2% is crucial, inescapable, central to the entire action of the play and tragically pulls the entire affair decidedly downward. It’s just one single performance. That’s all. The script, though a little fatty, is fairly compelling and Chris Penna’s set functional and appropriately sparse. Edward Hillier’s direction is, on most fronts, acceptable and the performances from the supporting cast are all fairly good despite no one quite nailing the British accent (though it should be said that the cockneys are far superior to even the fairly good attempts at something more posh). Robert Tsonos plays the patriarch of C Company with great wit and warmth; Tayves Fiddis is compellingly frustrating as the company coward (who could have been far more human if foiled correctly, but that is not Fiddis’ fault); Jonathan Silver kicks off the action with charm; Richard Beaune balances a turn as a compassionate but hard-line Colonel with a fantastically funny and even more fantastically touching turn as 2nd Lieutenant Trotter; all performances pulled together by Jesse Nerenberg as Raleigh, the audience’s conduit into the action- a sheltered, hero-worshipping upstart whose enthusiasm swiftly lands him at the forefront of trouble. Nerenberg delivers a strong performance full of character-defining detail (the way his eyes light up when his hero enters the room; how he strives to stand even straighter when already standing at attention) that helps the audience invest in his character as he navigates the stop-and-go story. But while Nerenberg’s Raleigh drives much of the action, the emotional arc of the text belongs to his hero, company commander Stanhope. He’s the lynchpin of the whole affair, the character whose story is the story of Journey’s End, the character for whom the other characters exist as foils (a character played by none other than Laurence Olivier in the original 1928 production). And in The Empty Room’s production, Stanhope is frankly terrible. Andrew Petker delivers an attempted British accent so dreadful that at times he seems to abandon it altogether. At other times he can be anywhere from Ireland to New Zealand to Missouri. His Stanhope has only two settings- catatonic and screaming, a reality that not only undermines his own complex emotional journey but that of the more nuanced performances around him. Leaving the theatre, one has to take a moment to feel their frustration with Petker and the over-long production he headlines. But after that moment, it’s more than possible to see Journey’s End for all the good that exists behind Petker. It just takes a fair bit of determination.